With the November security patch that began rolling out to Pixels last week, one change was made to the way Night Mode and Battery Saver interact. When the latter is enabled, the former immediately changes to on, and the behavior can't be modified, though you can manually switch back to off. Take a look at the GIF below. I start off in Developer options, with Night mode set to Always off. When I turn on Battery Saver, you can see two immediate changes. One is that the drop-down notification switches to dark (night mode is on) and two is that the Night mode option (bottom of the screen) switches by itself to Always on. I turn off Battery Saver and both return to their previous state. This means that no matter what you've chosen for Night mode, the Battery Saver will always override it. You can still turn Night Mode off manually, but the next time Battery Saver is enabled, it will go back to on. However, I can debate that it's still a good change, even if it's not user-configurable, as it helps save a bit more power by turning the notifications to dark. Too bad though that it's not all-encompassing. See, unfortunately, Night mode in Developer options only controls the notification drop-down. It doesn't influence the app drawer or the Google Discover Feed. Those are under the purview of Device theme in the Display settings, and they're not influenced by the Battery Saver. It also has no influence over night/dark mode in any other app that supports it. So while the change described here is a small step forward for more efficient battery saving, it's still only one minor improvement. 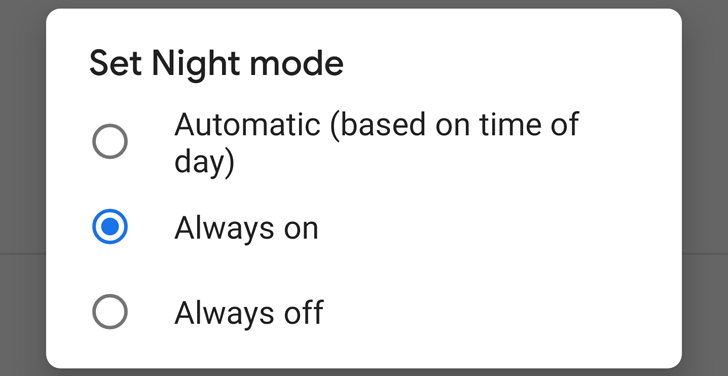 Another change we're told affects Night Mode is that, finally, choosing it to change automatically with the time of day works, switching to dark at night and light during the day. However, I can't verify this. No matter how often I change my Pixel 2 XL's clock time, I still have the same light theme. It's clear that Google is still trying different things when it comes to night/dark mode and hasn't yet settled on one strategy that works in all apps.